Deep vein thrombosis (DVT) is one of the common leg vein problems in the elderly which has potentially serious complications if left untreated. It is simply the formation of a blood clot in the deep veins of the leg – mainly the lower leg but can occur in the thigh. On its own this clot can significantly impair the blood returning from the legs to the heart and cause a host of symptoms. However, the more serious and potentially fatal consequences can arise when the blood clot dislodges from the leg veins, travels through the bloodstream to reach the heart and lungs. The risk of this occurring is much higher in the elderly. Slow movement or stationary blood in the vein. Damage to the wall of the vein. 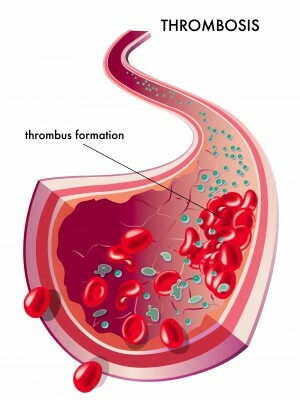 Activation of clotting factors (chemicals) in the bloodstream to trigger clot formation. Being restricted to bed rest. Injury to the leg vein including surgery to the leg. Pregnancy or the use of oral contraceptives or hormone replacement therapy. Age is another significant risk factor and DVT is more likely to occur after the age of 60. Seniors are therefore the highest risk group of not only developing DVT but suffering with the serious complications. Swelling of the leg or sometimes even both legs. Cramping leg pain mainly in the lower leg, ankle and foot. Skin color changes such as paleness of the skin, or a red or blue discoloration. Warmth of the skin usually over where the clot is located in the leg. Many of these symptoms closely resemble a heart attack and irrespective of the cause, it signals the need for emergency medical attention. Pulmonary embolism may also present with coughing up of blood which is not seen with a heart attack. DVT can be treated in several ways which are effective in preventing the clot from growing any further, reducing its size or obstructing it from reaching the vital organs in the trunk. One of the commonly prescribed options is a compression stocking. By placing more pressure on the leg, these stockings helps to ensure that blood does not flow backwards or become static which may increase the size of the clot. It also helps prevent swelling of the leg. Regular use of a compression stocking along with exercises to improve leg circulation are very effective measures for managing DVT. Regular physical activity like walking also ensures that the blood in the legs are in constant flow. However, these conservative measures need to be adhered to and undertaken on a constant basis for it to be of maximum benefit. If it is insufficient then medication or a surgical procedure may be considered. Blood thinners to retard the growth of the clot. Clot busters to dissolve the clot. If medication is not effective then a type of filter may be placed in the large vein to the heart (inferior vena cava). These filters, known as vena cava filters, prevents the clot from reaching the heart and lungs but can sometimes be the source of new clots.